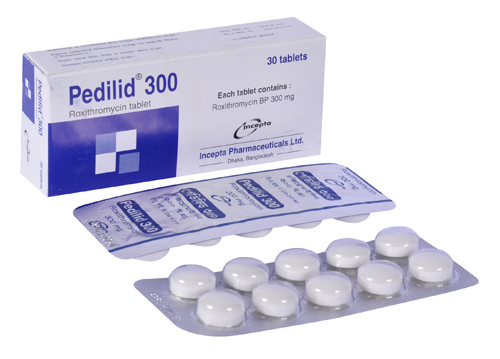 Pedilid 150: Each film-coated tablet contains Roxithromycin BP 150 mg.
Pedilid 300: Each film-coated tablet contains Roxithromycin BP 300 mg.
Pedilid powder for suspension: When reconstituted each 5 ml suspension contains Roxithromycin BP 50 mg.
Roxithromycin, is a macrolide with antibacterial properties similar to erythromycin. It is active against Gram-positive bacteria like staphylococci, streptococci, listeria, corynebacteria; Gram-negative bacteria such as gonococci, Haemophilus influenzae, Haemophilus ducreyi, Legionella, campylobacter, and atypical pathogens like Mycoplasma and Chlamydia. 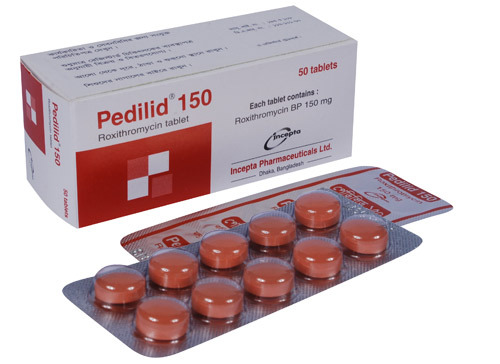 Roxithromycin has been found useful in the treatment of upper and lower respiratory tract infection, otorhinolaryngological, skin, dental and genital infections. It is well tolerated by adults and children. ENT infections like tonsillitis, pharyngitis, sinusitis and otitis media. 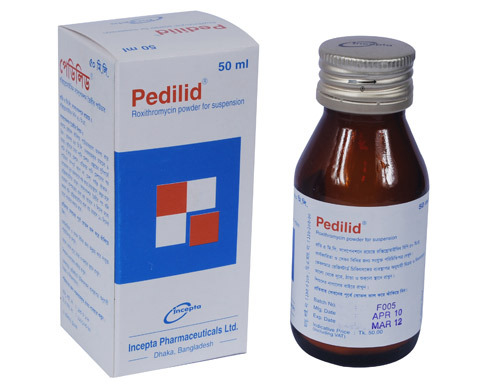 Skin infections like folliculitis, furuncles, cellulitis, carbuncles, pyoderma, impetigo and infected dermatitis. Genital infections like urethritis, prostatitis, cervicitis and salpingitis especially if produced by Chlamydia trachomatis. Adult dose: The usual dose for adults is one 300 mg tablet once daily or one 150 mg tablet twice a day for at least two days after resolution of symptoms, a normal course of therapy is between 5 and 10 days. Roxithromycin is best administered on empty stomach. In severe hepatic impairment the dose is 150 mg once daily. 6 to 11 Kg: 25 mg Roxithromycin 12 hourly. 12 to 23 Kg: 50 mg Roxithromycin 12 hourly. 24 to 40 Kg: 100 mg Roxithromycin 12 hourly. A normal course of therapy is between 5 and 10 days. Roxithromycin is well tolerated by patients of all age groups. Less than 4% of treated patients complain of side effects mainly nausea, abdominal pain, diarrhoea and hypersensitivity rash. Other side effects reported include vomiting, dizziness, headache, pruritus, dyspepsia, flatulence, tinnitus, vertigo and constipation. These are in general minor and do not necessitate withdrawal of therapy. Roxithromycin should not be used in patients with a history of hypersensitivity to the drug. In patients with hepatic diseases the dose of Roxithromycin should not exceed 150 mg twice a day. The safety of Roxithromycin in pregnancy has not been established. It appears in breast milk in small amounts and dose not produce adverse effects in the breast fed infant.